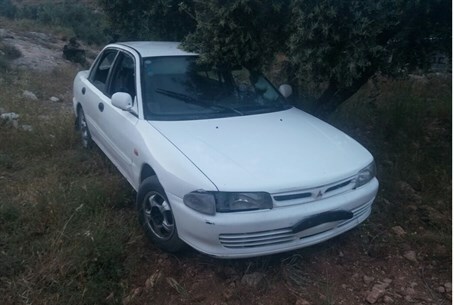 Two Palestinian Arabs arrested in Hevron after being found with damaged vehicle after joint IDF, Police, Shin Bet operation. IDF forces and the Judea-Samaria District Police, as well as the Israel Security Agency (ISA or Shin Bet), arrested two Arab residents of Hevron on Sunday in connection with Saturday night's car attack in the Hevron Hills. During the attack, a Palestinian Arab driver rammed his car into a police vehicle on patrol during a routine traffic stop. One officer was wounded and taken to Soroka Medical Center in Be'er Sheva; the driver then continued in the direction of the nearby village of Yatta. The incident was initially reported as an accident with a likelihood that it may have been a terror attack. Forces converging on the suspects' home found the offending vehicle with signs of damage; one of the suspects was in possession of the car keys. The two men, aged 26 and 23, were interrogated by Shin Bet forces and then transferred to Hevron police custody. Judea-Samaria Police District Commander General Shlomi Michael praised the rapid response of the security forces. "Every incident of this type will be acted upon quickly and decisively, in full coordination with the security forces in the district, to put our hands on criminals," he said. Car attacks have become more and more common in Judea, Samaria, and Jerusalem over the past year, beginning with a string of attacks in October.